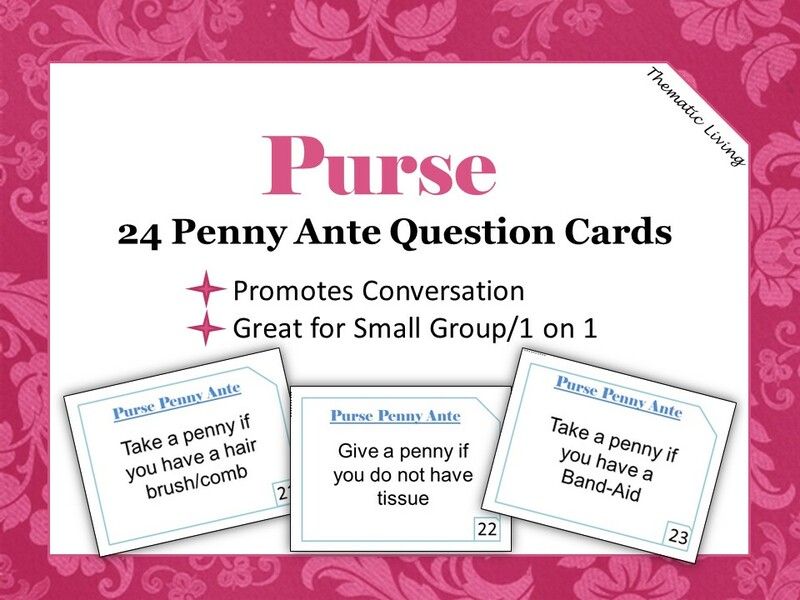 Penny Ante helps to strengthen and maintain skills for speaking, listening, reminiscing, critical thinking, communication, storytelling, and imagination. Each card contains large print so that the words are easy to read. Just print on card stock, laminate, and cut to start the fun. You may use a tablet or computer, if printing is not an option to display each card. Depending upon how many people are playing the game, everyone will receive at least 10 pennies (or poker chips) and at least 25 pennies (or poker chips) are placed in the middle or the “pot”. One person or each participant can take turns reading what is on each card. Each card allows the participant to express their thoughts and opinions when reminiscing or engaging in meaningful conversations. Extend this activity by having brief conversations about the topic presented on each card. For example, if someone has a movie ticket stub, you would then ask: What movie did you see? When? Who did you go with? Why did you go? (Leisure, Fun) How did you get there? (Bus, Car, Train); also known as the 5 W’s, Who What, When, Where, Why and How. All you need is a purse to get started. Read each card and follow the directions to play. Buy it once and use it for a lifetime!